Our latest addition to CodeMonkey’s Game Builder is here! It’s time to create your very own Sprites! CodeMonkey’s new feature allows you to add your own characters and objects to go along with the games you build on Game Builder. This course is a great platform for anyone who loves DIY activities. The first step to designing your own sprites is to read the directions. If you don’t continuously look at the guide on the left-hand corner you will get stuck, even though the answer could be right in front of you. By following the guide, you will learn how to successfully draw your own sprites in no time. In just 26 exercises, you will develop the skills to make your own characters, give them unique sounds, make them come to life and more! 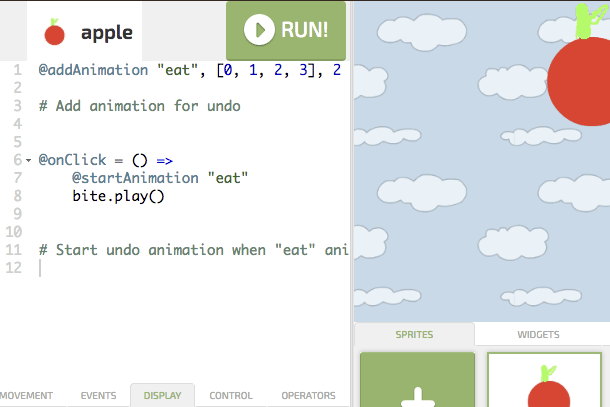 With CodeMonkey’s Game Builder, you can take your programming skills to the next level by creating your very own games. Learn more here. Next PostNext CodeMonkey’s NEW Competition is Just Around the Corner!